The Stairs have an additional coat of protective polyurethane added. Since the stain process is a bit messy, all of the stair's trim was re-pained white. Many people cut corners on making sure their is enough stain and sealant. It is difficult work, but it will last for decades when the work is done right the first time. Keeping hardwood floors in their top condition is relatively easy. All it takes is learning what is best for the wood floors and what is not good for them. Standing water is the most damaging. It can be harmful even in the form of moisture. Dirt and grit, physical stress, various chemicals and direct sunlight also lower the quality of hardwood floors. Before your hardwood floors are installed and finished during home construction preventative measures should be taken. Exposure to direct sunlight adversely affects the hardwood; it may cause unwanted discoloration. However, this is one the easiest problems to deal with, considering the hardwood floors are seldom touched by direct sunlight even with large-windowed houses. Water of any kind, when it seeps into the wood, can lead to abrupt degeneration. Whenever water or other liquids are spilled on the hardwood floors, wipe and dry the spot immediately to prevent the water from reaching deep into the wood. 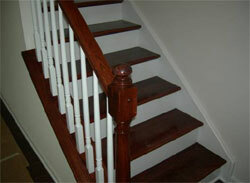 Coating the flooring with lacquer or polyurethane is widely used for this purpose. Humidity will damage the floors as well, though the effects do not show instantly. Relative humidity of 35% to 55% is advised to be maintained to keep the hardwood healthy. Physical stress shows up in the form of scratches and markings on hardwood floors. This cause of damage is usually a result of wood-unfriendly practices. Instead of focusing on fixing the physical damages, it is best to do some precautionary measures to maintain the high quality of the hardwood flooring. Heavy, too pointy or sharp, and rough materials that come into contact with your floors generally create a high stress factor. Heavy objects such as sofas, cabinets and even tables usually rest on very small points in the flooring, thus concentrating weight pressure on that point. Placing the feet of this furniture to wider padding will decentralize weight distribution. Pointy heels when used on wooden floorings also have a damaging effect. Utilization of padded mats on high traffic areas of the house will help in reducing stress on wood flooring. Sharp objects, when put in contact with flooring may lead to lacquer layer damage wherein water and moisture may accumulate. Rough objects on the other hand, like furniture edges when moving, even cleaning materials like mops and vacuum heads, can cause scratches on the floor. Vacuum heads and brushes that are too stiff, as well as soiled rags and mop heads should be checked to maintain cleaning of floors effective and not cause unnecessary damages. Various chemicals can harm the hardwood flooring as well. Dirt and grit, including sand collected in the corners and edges of flooring, may seem to have little to no effect on the flooring. Over time if not taken cared of regularly could cause problems. Dirt accumulation under furniture and other floor contacts, leads to moisture build up, it can also provide an abrasive property whenever accidentally moved with footwear. Abrasive chemicals, high concentrated solutions; both ammonia-based cleaners and acidic substances such as vinegar, strong bleaches and oil-based soaps may not only affect the lacquer or oil layer of the hardwood floor but also the flooring itself as well. Specific chemicals work for certain hardwood finishes, contacting the builder who applied finish to the flooring may be the best option in dealing with chemicals in maintaining these hardwood floors. Application of a new lacquer coating may also be done to increase the lifespan of hardwood floors and to repair minor to large-scale scratches. Hardwood floors, with their various natural finishes not only give an elegant effect in a household, but also give the home owner a feeling of being close to nature. For these things to last, however, much effort is required from the owner, including proper regular cleaning and prevention of exposure to harmful elements.